Maine quarterback Chris Ferguson throws a pass in the first quarter of an NCAA football game against UMass at Fenway Park in Boston on Saturday. 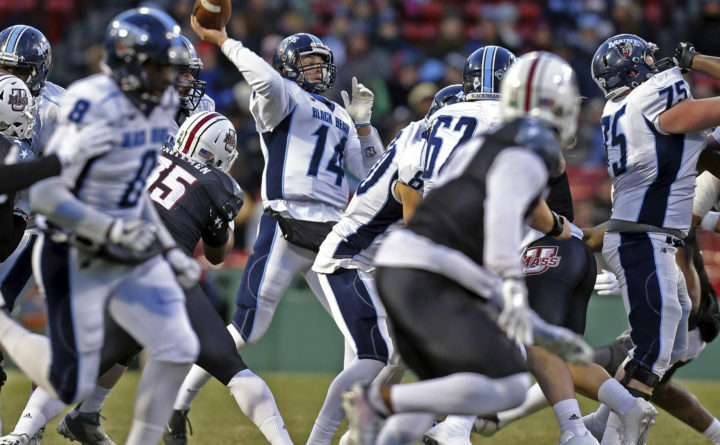 BOSTON — Andrew Ford threw for 355 yards and four touchdowns, three to Andy Isabella, and Marquis Young broke free for a 33-yard score with 1:57 to play as Massachusetts defeated Maine 44-31 at Fenway Park on Saturday night. Ford was 21-of-39 passing and surpassed 5,000 yards for his career, Isabella had eight catches for 152 yards and Young carried 19 times for 123 yards. Lee Moses also returned an interception 70 yards for a score for the Minutemen. Josh Mack had 22 carries for 110 yards and two touchdowns for the Black Bears. UMass, a Football Bowl Subdivision team, is now 3-7 while Maine, a Football Championship Subdivision team, is 4-5. Ford connected with Jessie Britt for a 33-yard score on the first drive of the game, but Earnest Edwards answered with a 95-yard kickoff return. Isabella had TD receptions of 69 and 12 yards to help UMass lead 24-16 at the half. After an 80-yard drive capped by Mack’s 1-yard TD and a two-point conversion tied the game to open the second half, Isabella scored on a 14-yard pass and Moses had his return. “It was a good win for us, no question about it. I know what it is like to be on the other side,” Massachusetts head coach Mark Whipple said. Dartmouth beat Brown 33-10 at Fenway on Friday night. Maine concludes its season next Saturday when it hosts Stony Brook at Alfond Stadium in Orono.